The Maze Runner was much better than I expected. Not something I typically would have picked up, but was on the list for book club. Now I now need to track down the rest of the books! The main character in The Maze Runner is a young boy of about 16 named Thomas. When the book begins he's waking up in a metal box in the ground, no clue where he is, why he's there, orwho he is. Thomas knows his name, but that's it. His memory has been wiped. I really loved that The Maze Runner was told ONLY from his point of view, because it makes figuring out what's going on that much more complicated. Thomas has all these instinctive abilities and desires - and even those instincts are to be questioned. He's a smart boy and I loved watching him figure out the mystery - because I couldn't do it. We get to know quite a few other characters in the Maze. They were well written and I could visualize each boy so clearly - they all have such strong personalities and sometimes that brings them into conflict. I will say, though, that this definitely isn't a character driven novel. You get to know the characters, but they don't drive it forward. It's the story - particularly the mystery - that kept me turning the pages. The Maze Runner is a brilliant concept. These boys have all been put in the Glade - an area at the center of a Maze - over a period of about two years without their memories. They don't know why they are there but they are trying to get out. So a group of boys, called Runners because they have to run to get through the maze, go out every day to try and find the way. After two years they haven't found a way because 1 - the walls move every night and 2 - it's dangerous out there. Weird creatures are in the maze and they are hunting the boys, trying to kill them. When Thomas arrives at the maze, things start going differently and the boys are convinced his arrival has something to do with it. Thomas knows they are probably right, though he has no idea why. The mystery of how they ended up there, why, and how they're going to get out kept me turning the pages. By the end, I still hadn't guessed. Best part, though, was that once I found out, I could look back and see where I SHOULD have figured it out! 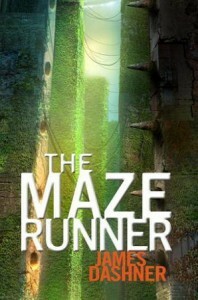 The Maze Runner ends with an epilogue that let's you know that the mystery isn't quite as solved as you thought. There's more to come and I can't wait to read the rest. Thank goodness the entire trilogy is already out or I'd be so frustrated. It's not a cliffhanger per say, but it's enough to make the next book a must!